This weekend will be filled with family activities, BBQ, outdoor games and of course fireworks as Americans celebrate Independence Day. If you haven’t made plans yet, or need some additional activities to complete your Fourth of July, below are some happenings in and around the Roxborough area. 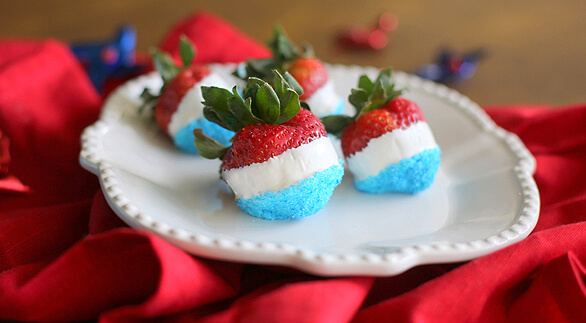 Also included within this blog are fun red, white and blue treats you’ll want to whip up for friends and family this weekend. The Roxborough Bike Parade will take place this Saturday at 10:00 a.m. at the Deirdre Meyer Park (intersection of Roxborough Dr. and Willow Broom Trail). Fire trucks will lead and follow children on their decorated bikes, scooters, wagons and strollers on a short route. Afterwards, the firemen will give children the opportunity to sit in the trucks and answer questions. Rick DeGrande will also be shooting off red, white and blue streamers from an air cannon in lieu of fireworks and Roxborough residents John and Diana Trenck will have a cooler full of popsicles for everyone! For more information, please contact Kim DeGrande at 303-908-7566. Chatfield State Park will be celebrating our nation’s bird from 7:00pm to 8:00pm at the campground amphitheater on July 4th. Learn about the bald eagle while playing a fun trivia game and join in on eagle crafts that you can take home. Although you won’t be able to light fireworks off in the Roxborough area, you can still see the beauty of them nearby. Start the weekend off early at Clement Park on July 3rd for the Red, White and You party from 5:00pm – 10:00pm. Admission is free and there will be plenty of fun activities for all ages. Food concessions, a kid’s bounce house and exhibitor booths will accompany music and a fireworks display scheduled at 9:30pm. Don’t forget to car pool and leave your pets at home. Some other nearby firework displays can be seen July 4th at Highlands Ranch Town Center, Cornerstone Parks in Littleton and Metzler Ranch Park in Castle Rock. All firework displays are contingent on ever-changing weather and fire conditions and will begin around 9:30pm.